I, Zeb the Duck, had a great surprise last night. 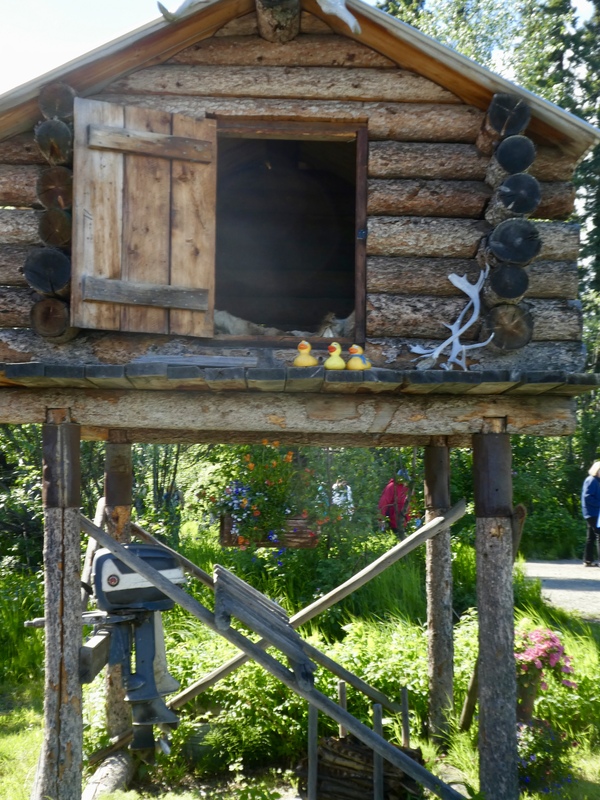 Soapy Smith Duck and his mom flew to Alaska to be with us. That is wonderful. Today, I, Zeb, Eider and Soapy Smith Duck, took our two humans on a three hour riverboat tour. Before getting on the riverboat, we had to look through the gift shop. In reality, the moms were getting cold. It was about 50 F (10 C) and the wind along the river was rather chilly. They had long sleeves and light weight jackets, but they were still cold. We ducks think they just wanted new jackets. But, even that is fine. Of course they bought jackets and we looked around. 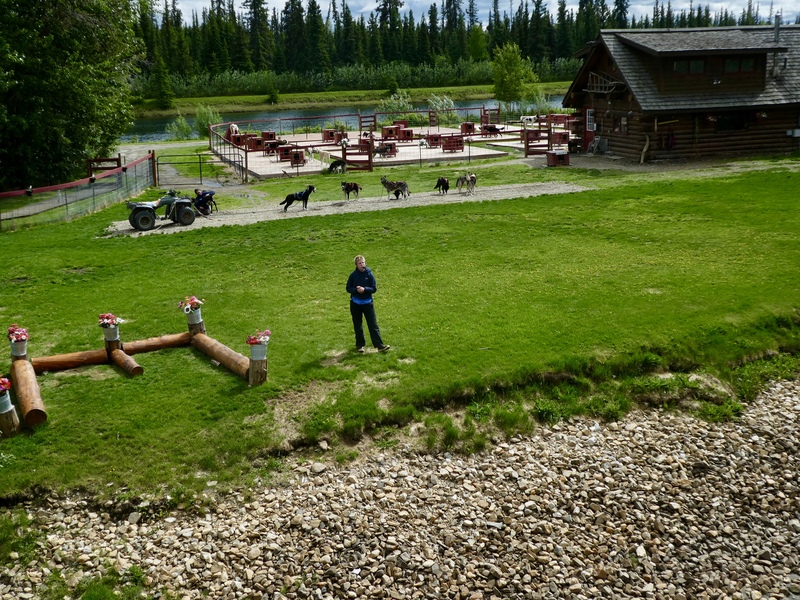 Alaska is famous for dog sled racing, and a woman, Susan Butcher was a famous racer. We loved this display dedicated to her. We will tell you more about Susan later. Well, time to get on our riverboat. This is Riverboat Discovery III. One of the few sternwheeler boats in use. We love the paddlewheel in the back. The information says there are 20 paddles turned by hydraulic motors. We will show you later. 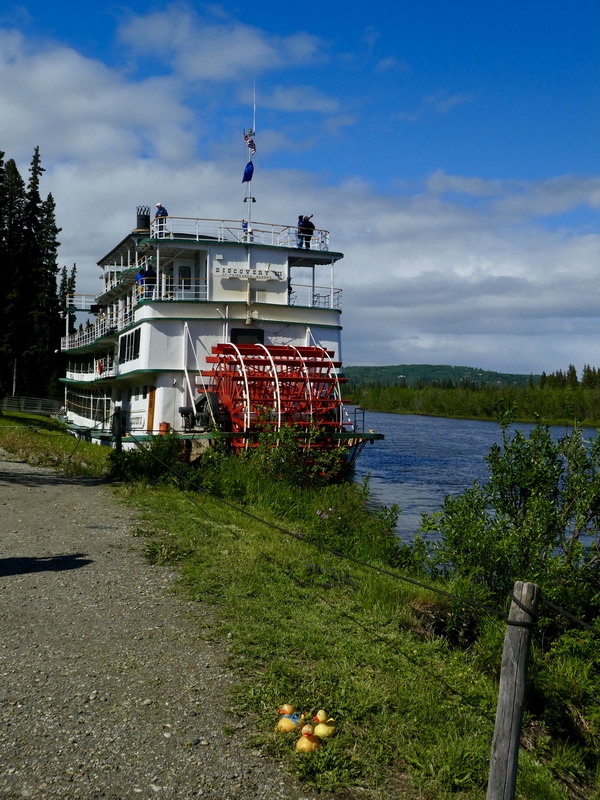 Shortly after beginning our cruise on the Chena River, we watched a small plane take off on the river. He circled the area and then, with pontoons, landed on the river. In Alaska, and most of the Arctic, small planes are the way to travel. The harsh climate makes building and maintaining roads very difficult. Our first stop was the dog kennels now owned by Susan Butcher’s daughter, Tekla. Sure a pretty place. 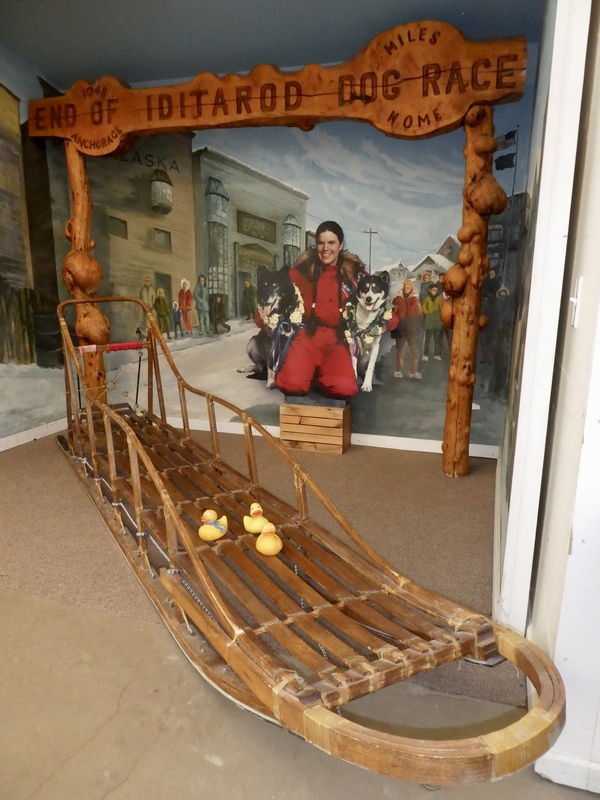 Susan Butcher won the Iditarod Race 4 times. This is the famous dog sled race from Anchorage, Alaska to Nome, Alaska 1,100 miles away. Susan passed away August 5, 2006 after a battle with leukemia. Tekla explains that the dogs want to run. They will pull that 4 wheeler around the kennel area. We watch more of the run, but some is just too far out of our view. We were not allowed to get off the boat. And this is dog training? Tekla says the young dogs are learning to socialize. Also they are learning commands. 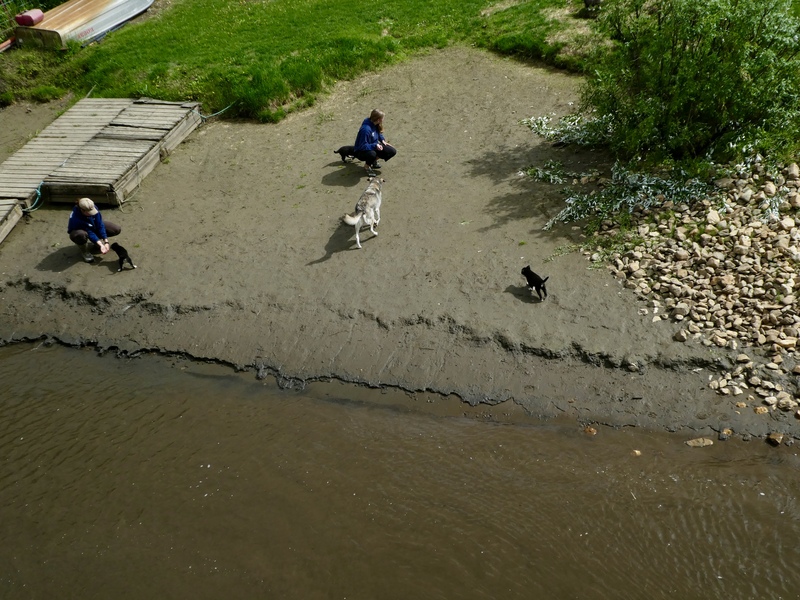 It looks like fun playing on the muddy riverbank. It is nice that training can also be fun. 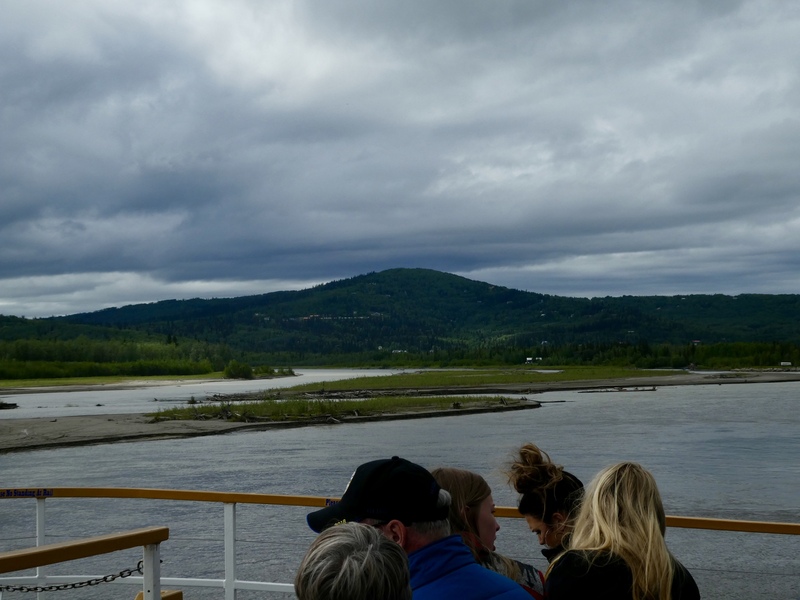 Continuing along the river, we come to the meeting of the Chena River and the Tanana River. These rivers are tributaries for the Yukon River. Isn’t this a pretty place? In 1898 Charles M. Binkley hiked over Chilkoot Pass with other stampeders during the gold rush. 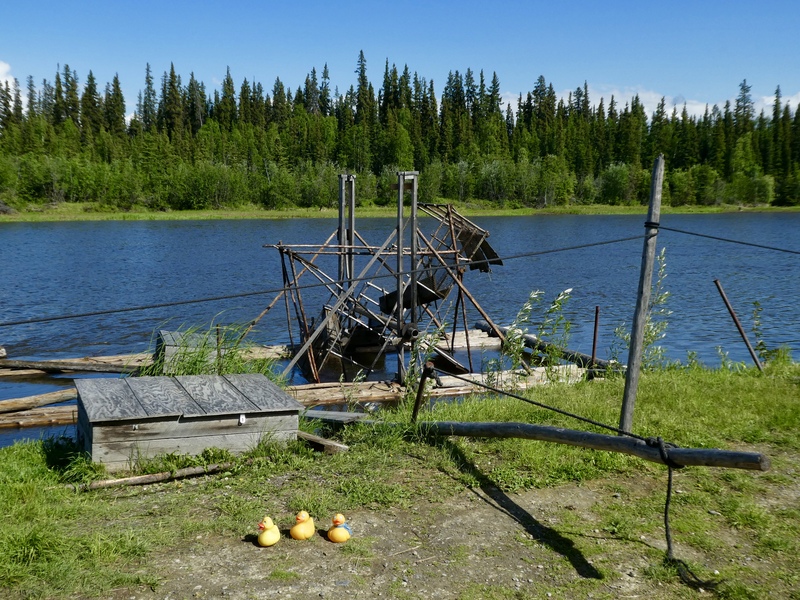 However, he was not particularly looking for gold, he wanted to chart and navigate the Yukon River and its tributaries. 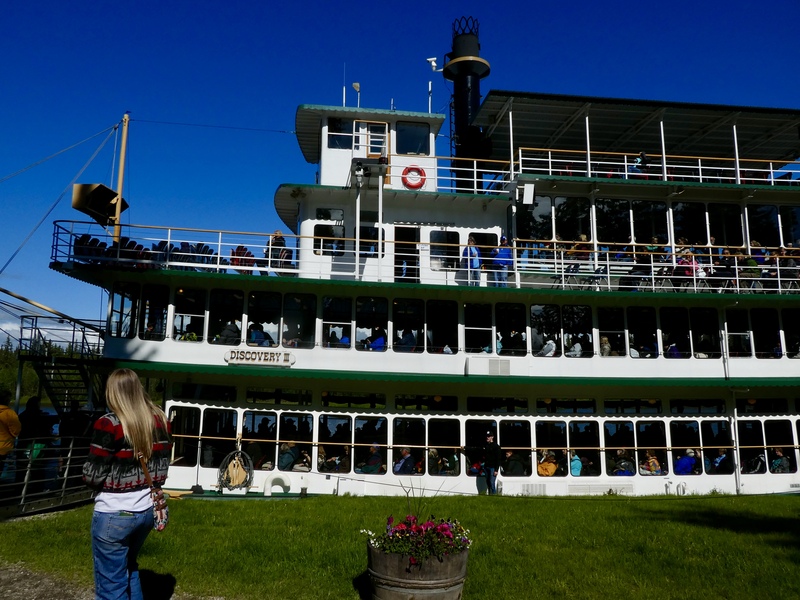 Now, over 100 years and 5 generations of the Binkley family are offering very popular riverboat tours. 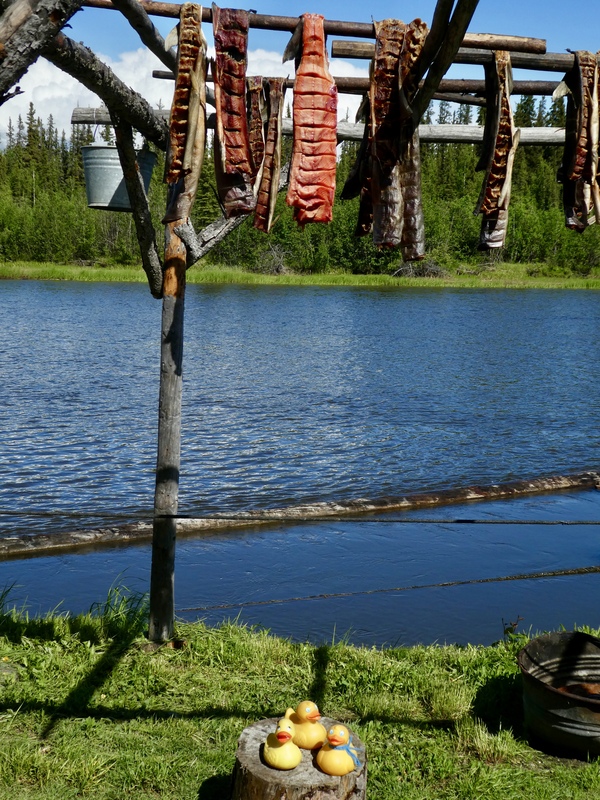 Our next stop, is Chena Indian Village. 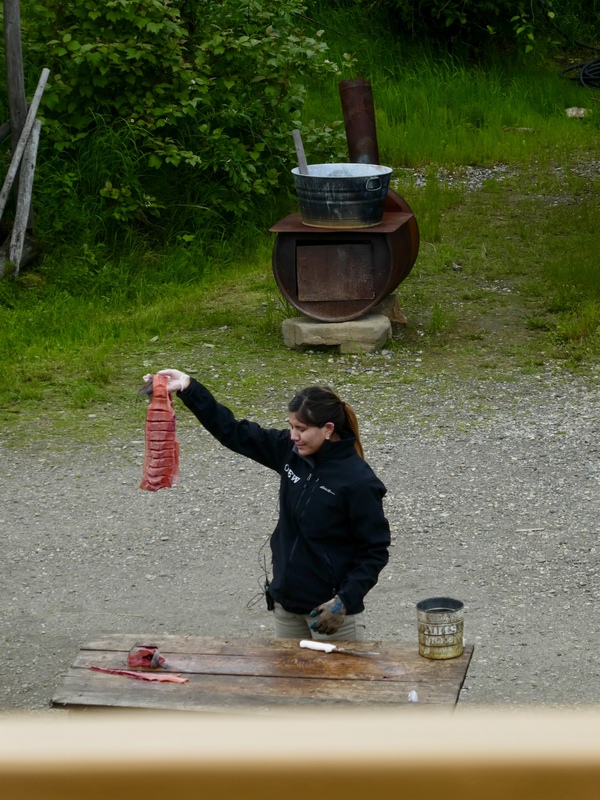 While still on the boat, this lady, an Athabaskan Indian, shows us how to prepare salmon for the drying racks. Skinned, filleted, cut or scored, and ready for the drying racks now. She made it look so easy. We get off Discovery III, our riverboat, and explore this village. This is a fish wheel. The fish swim into the turning wheel and get caught. This is easier that using an actual fishing pole. The Athabaskans only catch and keep what they need. During the long Arctic winters people may get lost or delayed while traveling. This is a cache. Notice that it is too high for animals to get inside. It keeps necessary supplies for whom ever needs them. Also, the cache is supplied by the owner for his own travels. If you use something from the cache, try to replace it when you can for the next person. Remember these winters have long nights and short days. Temperatures of -40 (same for F and C) are not uncommon. People help each other to survive these harsh conditions. Of course in the summer, the days are long and the nights very short. In Fairbanks, in late June, there are 3 or less hours of darkness. 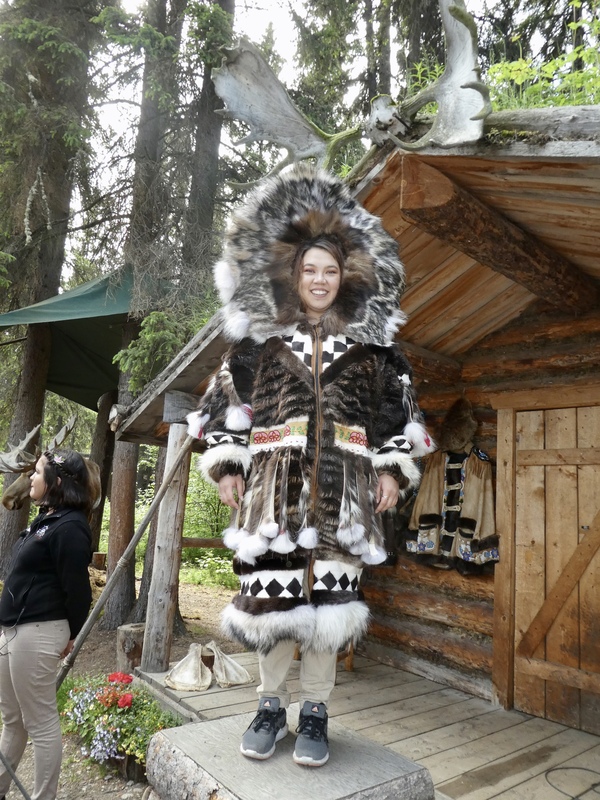 While in Chena Indian Village, we were taught some of the ways of the Athabaskan Indians. We met the reindeer. 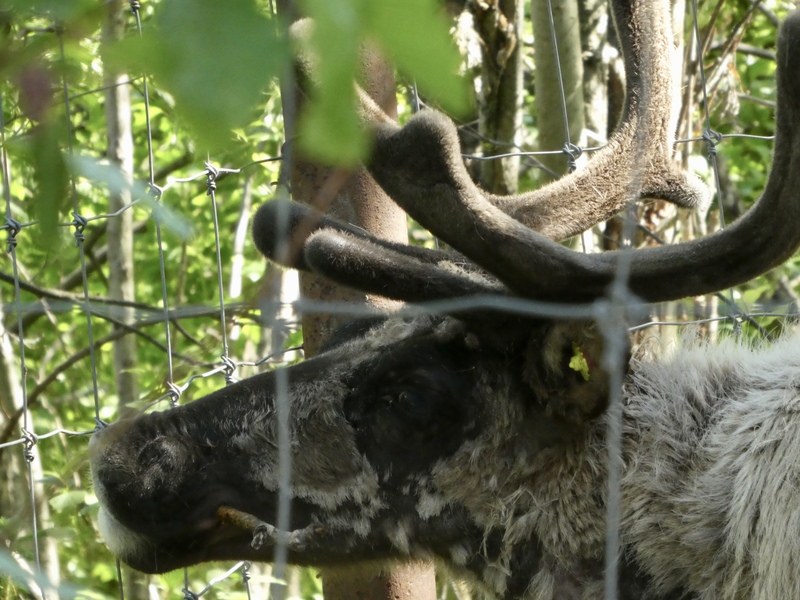 This reindeer are kept in a large enclosure for us to see. They receive a healthy diet and are well cared for. 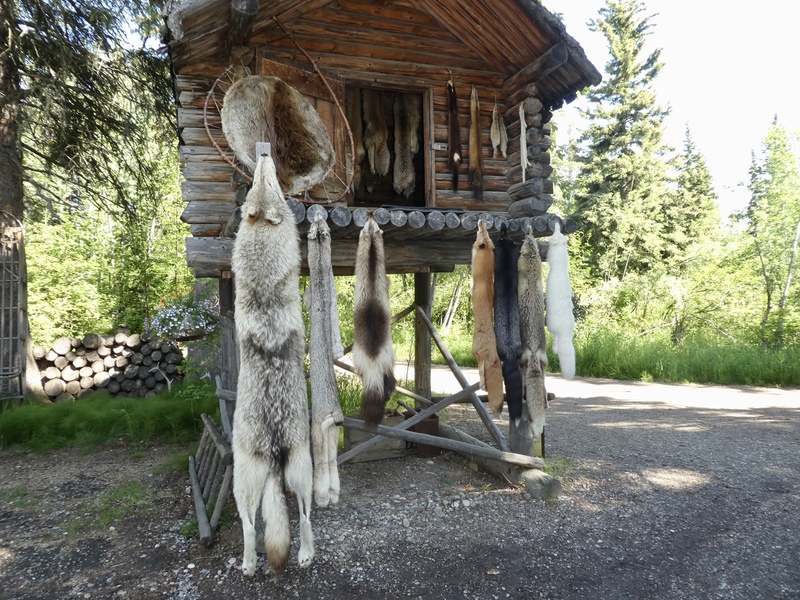 These are samples of fur pelts. These furs are very warm and necessary during the cold winters. Here is a young lady wearing a very warm fur coat. Much work goes into making this coat and it is certainly well cared for and a prize possession. Our last stop was the gift shop. This is a statue of Granite. Granite was the runt of the dog litter, but Susan Butcher saw great potential in him. 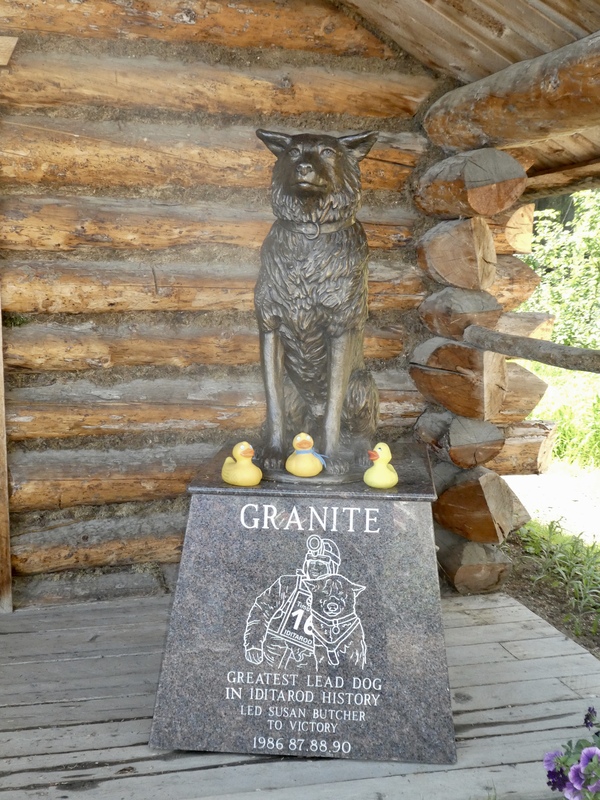 Granite became her lead sled dog and Granite lead her team to four wins in the Iditarod Dog Sled Race. Discovery III is waiting to take us back to the starting point and to our cars. That is a great paddlewheel. This a great boat tour. When in Fairbanks we hope you enjoy this trip. We loved it.